His is the highest profile case yet stemming from Special Counsel Robert Mueller’s Russia investigation. PAUL MANAFORT, US President Donald Trump’s former campaign manager, has been sentenced to a further three and a half years in prison. Manafort was first sentenced to four years in prison last week by a federal judge for tax crimes and bank fraud. He was sentenced today on conspiracy charges. “The defendant is not public enemy number one,” US District Court Judge Amy Berman Jackson said in delivering the sentence. “But he is not a victim either,” the judge said today, adding that the veteran Republican lobbyist had shown little remorse and had lied repeatedly. His is the highest profile case yet stemming from Special Counsel Robert Mueller’s Russia investigation into Russian interference in the 2016 presidential election. He is one of a half-dozen former Trump associates and senior aides charged by Mueller, who has been investigating Russian meddling in the 2016 election and possible collusion with the Trump campaign. 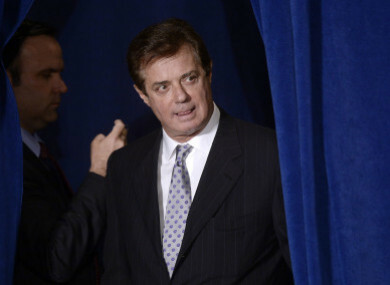 Last week’s charges against Manafort were not connected to his role in the Trump campaign, which he headed for two months in 2016, but were related to lucrative consulting work he did for Russian-backed Ukrainian politicians from 2004 to 2014. Email “Trump's ex-campaign chief Manafort sentenced to three and half more years in prison”. Feedback on “Trump's ex-campaign chief Manafort sentenced to three and half more years in prison”.